Current research indicates that the lack of normal blood supply to the hoof is a major factor in the onset, re-occurrence, and failure of laminitis cases to heal. Nitro PRO triggers the production of nitric oxide to damaged tissues to increase blood flow, stimulate the development of new blood vessels and prevent capillary blockage. Veterinarians are increasingly turning to Nitro PRO for the base support of their treatment of laminitis. Nitro PRO is a good product to keep on hand for emergencies. Laminitis/Founder is believed to be caused by insufficient blood flow to a horse's feet and reduced blood supply to the foot is a crucial factor, resulting in severe pain and cell death. 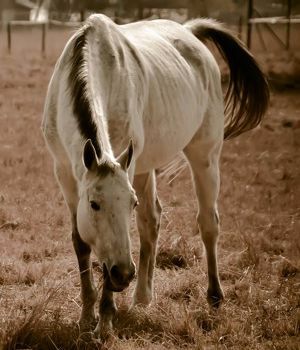 Stress of some kind typically initiates an episode of laminitis and stress depletes a horse's body of substances such as Nitric Oxide, which is needed to keep blood vessels relaxed and open. It is now believed that laminitis is caused by decreased production of Nitric Oxide, thus reducing blood flow to a horse's feet. The loss of proper blood flow to the hoof weakens the hoof. Nitro PRO is designed to trigger increased nitric oxide production in the body which stimulates the blood flow to the hoof, speeding healing. It is effective to resolve chronic Laminitis and the maintenance protocol (Laminitis PLUS) helps to prevent reoccurrences.